I am infatuated with my new skirt. It’s just a simple stretchy tube covered with black sequins but it’s filled with wardrobe possibilities. Next I wore it out running around with a basic white tee, black converse sneakers and a pinstriped men’s fedora. The look was casual, yet unexpected. I am plotting all the ways I can style this little tube of versatility for fall. Tights and a black turtleneck sweater… a boyfriend cardigan and boots. How about a denim shirt and a leather jacket? The options seem endless. The key to wearing a piece like this is to throw it off balance. Taking it too seriously could result in looking like Liza Minnelli or a Rockette. Treat it like a pair of jeans that can take you anywhere you want to go. Mix it up with unexpected pieces, but keep them simple and clean. Like most divas, this skirt does not like to compete with other glamorous items for attention. As summer drags on we all need a little pick me up from time to time. 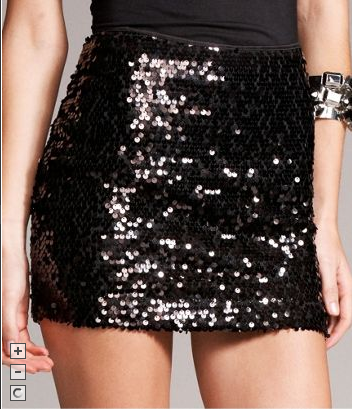 Mine came in the form a little sequined skirt. This entry was posted on August 10, 2010 at 1:47 am and is filed under fashion. You can follow any responses to this entry through the RSS 2.0 feed. You can leave a response, or trackback from your own site.